Creativity, accountability and intentionality are the recurring themes of Trevecca’s new Bachelor of Arts in Management and Leadership program. Formerly known as the Bachelor of Arts in Management and Human Relations (MHR), the program is taking a new approach with its students. Heading up portions of the new curriculum is Dr. Julie Rigsby, assistant professor of leadership. Rigsby, a longtime employee of Trevecca, began her time on the Hill in 1994 as an undergraduate. 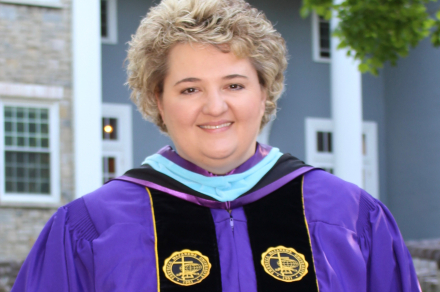 Rigsby went on to earn two advanced degrees at Trevecca: a master’s in education in 2000 and doctorate in leadership and professional practice in 2016. Before teaching, Rigsby was an admissions counselor at Trevecca, where she gives much of the credit in developing her leadership skills into her role as a professor. Her fellow faculty members in Trevecca’s School of Graduate and Continuing Studies recognize the value Rigsby brings to the program. The Bachelor of Arts in Management and Leadership program is structured and designed to uniquely fit the needs of working adults—with creativity, accountability and intentionality being at the forefront of the curriculum. Intentionality is a word echoed among faculty members in the School of Graduate and Continuing Studies. On the academic side, the program has been revised and updated to offer students up-to-date real-world information for people looking to advance their careers. Rigsby says the focus is on the practical application of management and leadership theory. Another strong thread in the program is taking a strategic approach in the way the curriculum is set up, allowing students to gain skills to become effective communicators. “Anyone that’s spent time in the workforce understands the importance of learning how to communicate effectively, which is critical in today’s world as we go more and more digital,” Rigsby said. Rigsby emphasizes that each semester is staged to focus on how to write effectively, speak effectively, supporting students’ thoughts through research, taking that information and using it to effectively relay their ideas.